Had to share this yummy bit of info that I just received. Anyone out there love warm, doughy pretzels as much as I do? I'm not talking about those rubbery microwaved hot pretzels from the little league concession stand...I mean a freshly baked German-style version that is crusty on the outside and then steaming and soft on the inside that you can then dip in a spicy mustard for a tasty finish? Yeah, those kind! Well, you don't have to head into the city to enjoy them at a dingy German pub. Ben's Soft Pretzels is a rapidly-growing company that now has more than 40 franchises, with several in Indiana and Illinois. There are also plans to expand further this year to have bakeries inside many Meijer and Wal-Mart stores. On Thursday a location will open inside the Meijer location in Highland, Indiana. If you're in the area, stop by for a free pretzel between 11:30 and 5:30 p.m.
WHAT: Ben’s Soft Pretzels (www.benspretzels.com), is a leader in the soft pretzel market, offering preservative-free pretzels baked fresh on-site daily in their daily bakeries is celebrating the Grand Opening of the new bakery in Highland, Indiana inside Meijer. The Grand Opening will include a Ribbon Cutting and Free Pretzels being offered to the public. Ben’s Soft Pretzels is one of the fastest growing quick-serve franchises in the US. There are currently more than 40 Ben’s Soft Pretzels bakery locations throughout Indiana, Illinois, Michigan, Wisconsin and Florida, with 50 additional pretzel bakeries which will open in 2015, many of which will be located inside Meijer and Wal-Mart Stores. 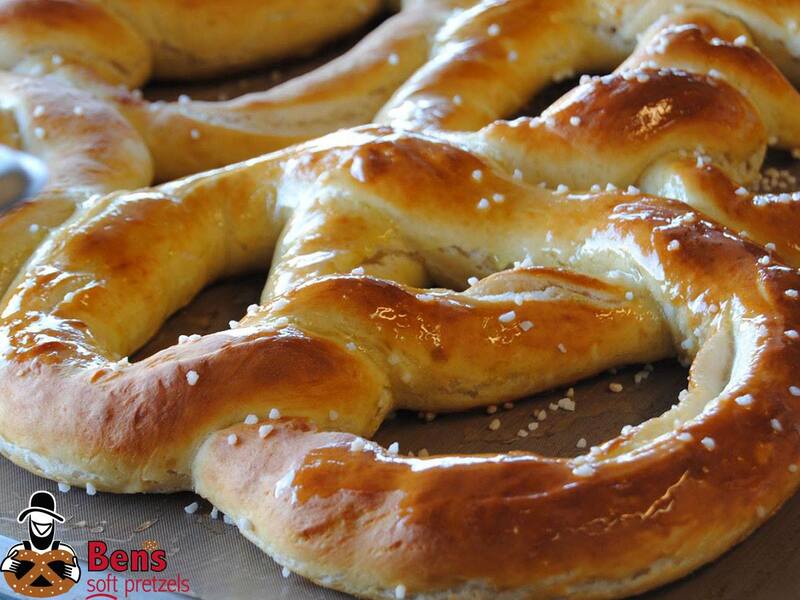 "The first time I had a Ben’s Soft Pretzel, I knew that it was something special. It was the most delicious pretzel I had ever had, and it turned me into a pretzel lover! I knew more people needed to enjoy what I had experienced with my first pretzel, so I pursued opening up our new store located in the Highland Meijer,” said franchise owner Edwin Negron of Ben’s Soft Pretzels Highland. “We hope to bring the best pretzel experience possible to the Highland community and become more involved with the community.” According to Negron, in the upcoming years there is a plan of expansion into other communities, so that everyone can enjoy a Ben’s Soft Pretzel. Goshen, Ben Miller of Shipshewana in Indiana. Ben’s serves an Amish/Dutch inspired soft pretzel and other pretzel products. MENU: A fluffy, melt-in-your-mouth taste, and often enjoyed with a wide array of gourmet dipping sauces, Ben’s Soft Pretzels are almost 2x the size of other pretzels and feature imported salt from Germany. In addition to the legendary Jumbo Soft Pretzel, our Buggy Bites offer customers delicious, bite size pretzel perfection. Our Pretzel Stixs feature all of the goodness of a traditional pretzel, in perfect-dipping form. An all-beef frank Pretzel Dog which includes sliced cheese enclosed in a pretzel style bun. Ben’s Soft Pretzels also offers several Pretzel Pocket sandwiches. Customers can enjoy any Ben’s Soft Pretzels bakery item with over eleven unique dipping sauces including the famous Amish Sweet Mustard or Homemade Vanilla Icing. Ben’s Soft Pretzels fans often purchase multiple dipping sauces to find out their own favorite flavor combinations or customize by using Bake & Shake seasonings.